These models from Unibond are not powered by electricity or batteries. They have a salt capsule inside which with the help of ventilation draws moisture out of the air and drips down into the container below. You just pour away the salty water as it fills. The salt ring inside does dissolve over timebut it can be replaced, and it should last 2-3 months depending on conditions and size of the room. It does need a clear area of around 10 cm around it on all sides, to work properly, so don’t poke it away in a cupboard, or stack things around it. There are some gel versions on the market you could use in enclosed spaces like wardrobes. It can be really dangerous to drape clothes over some types of heater, and they will usually have a warning label on them. Your radiators, and other forms of heating, need space to form a convection current – which sends heat evenly around the room. Air warms and rises above the heater and as it cools it falls down to the ground causing a circular flow of air. You won’t feel it, but it is happening, providing your radiators have enough air around them for this to work. Always use a property clothes airer, or indoor line. Hang clothes in an area that can be properly ventilated to allow the free flow of air, which is more effective than heat for drying clothes anyway. Along with correct ventilation, keeping a room thoroughly and evenly heated is one of the keys to avoiding condensation. This does not mean it has to be hot, just even. So, if you have a cooler room such as a porch, conservatory or utility room that is not well heated, you could consider an economical plug-in heater. The pictured Dimplex Wall Mounted Tubular Heater 655mm 120 Watt is available from our own store online. All of these activities add moisture into the air, which will then condense out again as it hits a cooler surface. It is best to dry clothes outside when it is possible to do so. However, you can use a condensing tumble dryer or make sure your normal tumble dryer has ducting to extract warm moist air outside. Fit extractor fans in the kitchen and bathroom, and these can be the sort that has an integral humidistat which automatically triggers them into action as the humidity rises. You will need to make a hole in the outside wall for ducting for these extraction systems and for this you will need a Core Drill Bit like the one pictured above to drill through the exterior wall and you can see our Project here. You will also need an SDS drill, both of which you can hire or buy, depending on the amount of DIY work you intend to do. One of the most effective ways to get rid of moisture from your home is to use a mains-powered dehumidifier. They work by condensing the water in the air onto a cooling plate inside. Water is collected in an internal tank which you then empty as necessary. Dehumidifiers have an automatic shut off if the tank gets full, to prevent a leak which would be as bad as the condensation! 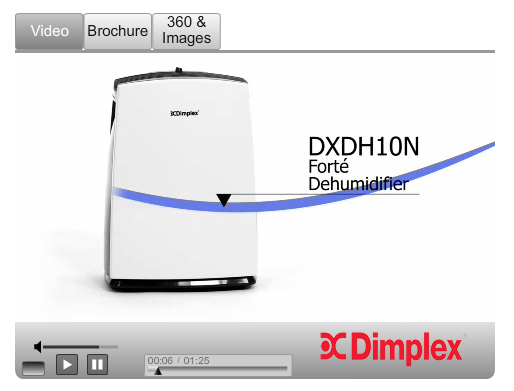 Check out this video from Dimplex site which explains how it works. Condensation can cause damage to décor including mildew, peeling wallpaper and efflorescence, and it can cause rot to timber. These conditions are bad for your health too. 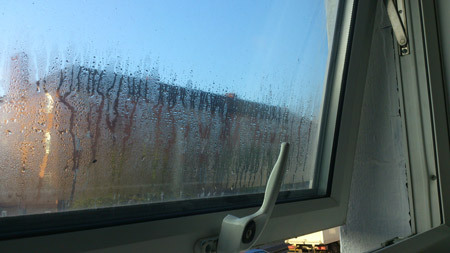 For a guide to the causes of condensation, and how to cure it, head over to our condensation project on the main site.